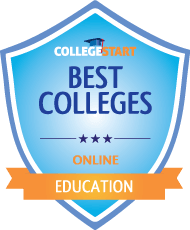 Slippery Rock University is one of the colleges with best value online education degrees. The university offers several programs at the master’s level and one at the doctorate level. The masters’ programs include M.Ed. in Special Education, M.Ed. in Elementary Education, Master of Education in Technology for Online Instruction and M.Ed. in Secondary Education. Students pursuing the M.Ed. in Special Education may choose a concentration from: Birth to Grade 8, Grades 7-12, Supervision and Autism. The elementary Education has 3 specializations which are K-12 Reading Specialist, K-12 Reading Specialist with Coaching Literacy Endorsement and K-8 Math and / or Science. There are also certificates and endorsements in Education. These are Teaching Online Certificate and an Endorsement in Special Education: Autism. The university offers one doctoral program which is Doctorate in Special Education and several masters’ programs. SRU prepares students for their careers and future lives by strengthening their leadership, social and intellectual aspects. It is accredited by the Middle States Commission on Higher Education (MSCHE). Of the colleges we evaluated, The University of England scored a high of 96.6 that ranked it among the top for online for colleges offering online education degrees. The University of New England offers 100% online education degrees and certificates with an aim of developing smart and resourceful teachers who pursue their jobs with care and competence. The programs available include a Master of Science in Education, a Post-Master’s Certificate, a Certificate of Advanced Graduate Study and a Doctor of Education in Educational Leadership. The U.S News and World Report ranked the University of New England highly in its 2016 list of Best Online Graduate Education. The 30-credit hour Master of Science in Education can be completed in just under 24 months. It includes core courses of 3 credits each as well as elective courses. The core courses include Teacher as Leader, Action Research, Differentiation Theory and Strategies, Portfolio and Motivational Theory and Class Management. The program includes focus areas such as Curriculum and Instructional Strategies, Educational Leadership, Inclusion Education and Literacy. The College of Education at the university is accredited by the National Council of Accreditation of Teacher Education (NCATE). Online graduate degrees include, A Master of Education (M.Ed.) in Special Education, (M.Ed.) Curriculum and Instruction – Mathematics Education, (M.Ed.) Curriculum and Instruction – Early Childhood Education, (M.Ed.) Curriculum and Instruction – Health Science Education, (M.Ed.) Administration and Supervision – Higher Education. Other online degrees include Education and Policy Studies and Higher Education, Health Science, Educational Psychology/Special Populations, Math Education and Science Education. Online Certificates offered include Online Teaching and learning and Designing and Developing Educational Multimedia. The online graduate program offered is ranked #1 by U.S News and World Report. Tuition costs per credit hour is $405 for in-state students and $867 for out of state students. Ranked among the best online graduate programs in Education by the U.S News and World Report and accredited by the Council for the Accreditation of Educator Preparation, this university offers quality education programs. Its offerings include : Blended and Online Learning and Teaching, Coaching, Educational Leadership, Institutional Research, Instructional Systems, Special Education Studies, Learning and Cognition, Educational Leadership and Policy Online. Tuition depends on the status of residence with in-state students spending $514 per credit hour and out of state students spending $614 per credit hour. U.S News and World Report has ranked the College of Education at the Northern Illinois University as having one of the top four online graduate programs. Online courses are offered in the college’s departments of Leadership, Educational Psychology and Foundations, Educational Technology, Research and Assessment. Tuition for the programs depends on whether one is taking a part time or full-time course and also on residence status. Within the state, part time cost per credit hour is $343 and this drops to $331 for full-time students. For out of state students, part-time costs per credit hour stand at $686 and this figure drops to $663 for full-time students. The U.S News and World Report ranked the university in the top 25 for its online undergraduate and graduate programs. The university offers online Masters degrees in; Adult Education, Art Education, Curriculum and Instruction, Earth Sciences, Educational Leadership, Higher Education, Learning design and Technology. The college of education at the school is accredited by the National Council of Accreditation of Teacher Education. Tuition stands at $784 per credit. The U.S News and World Report ranked the university as having among the Best Online programs. Offerings include, a Master of Arts in Education – Curriculum and Instruction, Master of Arts in Education – Training and Development, Master of Arts in Educational Technology, Master of Arts in School Principalship and Master of Arts in Teacher Leadership. Other offerings include a Doctor of Education in Educational Leadership and Educational Technology. A graduate certificate in College Training is also offered. Tuition for graduate courses is $510 per credit hour. This is significantly reduced to $345 per credit hour and $305 per credit hour for veterans and military students respectively. The teachers program at Angelo State University prepares its graduates for a rewarding career in middle school and elementary education, and provides knowledge and skills that enable them to make a positive impact on their students. It includes numerous sessions in clinical teaching and real classroom settings to prepare teachers with real-world experience. Teachers gain the skills to teach in front of a classroom, create and deliver lesson plans, and to demonstrate skills with technology and multimedia presentations. A strong emphasis is placed on technological skills.Through the Innovative Teaching Center, students gain access to a classroom fully equipped with state-of-the-art learning and teaching technology. Average tuition cost per credit at this university stands at $254.73. Baker University has been accredited by the Higher Learning Commission of the North Central Association of Colleges and Schools. It offers various education degree programs that include a Master of Arts in Education program that is offered online. This program allows teachers to develop new skills without abandoning their current responsibilities in their classrooms. It is a 36-credit hour credit program that helps refine the skills of practicing classroom teachers in order to enable them to become exemplary teachers. It allows them also to keep up with developments in the education sector. An accelerated option is also available for students. Students of this program can choose electives from any of the following specialization areas: Curriculum and Instruction, Technology, Multicultural Classroom and Student Diversity and Generalist. Each program is delivered by highly knowledgeable educators with many years of firsthand experience and knowledge. Up to 6 credit hours of previously earned credit may be transferred to one’s degree program. The cost of tuition for online programs is approximately $810 per credit hour. Financial aid is available and is a combination of state grants, federal grants, university scholarships, student employment opportunities, and student loans. Bluefield College is accredited by the Commission on Colleges of the Southern Association of Colleges and Schools. The School of Education at the Bluefield College offers an online Master of Arts in Education degree program that is designed for practicing teachers who are already licensed. It is also suitable for teachers with an inactive license who wish to earn more credits for renewal, and for students wishing to obtain a teaching license in Virginia. This program emphasizes research as a means of enhancing teaching and learning. The flexibility of the program means that each student can commit to a personalized plan of study. Coursework emphasizes using data for positive change and action-related research. This demonstrates that the science and art of teaching is evolving to meet the growing needs of all learners. Career opportunities available to graduates of this program include: Curriculum developer, School Administrator and Higher Education Faculty among others. Tuition costs $970 per credit hour. Financial aid is available and it includes student loans and employment opportunities. Baker College prepares students of it’s education programs for exciting teaching careers through a curriculum that is designed with input from teachers, educational professions and administrators. Among the online graduate education programs offered is a Master of Science in Educational Leadership. This program aims to improve learning in both elementary and secondary schools. It helps its students develop leadership skills that are required to improve student learning. Emphasis is put on the use of technology as a tool for improving efficiency and managing information. Two different concentrations exist: a concentration in K-12 education or in a higher education. Students acquire a deep understanding of the typical educational leadership components that include organizational development, ethics, budgeting and community relations. Baker College receives it’s accreditation from the Higher Learning Commission of the North Central Association of Colleges and Schools. Tuition costs $390 per credit hour. Auburn University is accredited by the Commission on Colleges of the Southern Association of Colleges and Schools. It offers a Master of Science in Adult Education. This program is available online. Through this program, students are able to address issues in the training and development of educators. Coursework is designed to allow students to incorporate educational theories into practice and to provide technical updating and professional development. Students learn to develop the competencies of professional education practitioners and to use their new knowledge to find solutions to educational practices and programs. It prepares students for careers in fields such as: college and university faculty, industry and business trainers, educational program writers and evaluators, independent training consultants, community leadership positions, teachers of adult basic education and authors of self-help books. Tuition costs $437 per credit hour. Various financial aid options are available for students of this program to take advantage of. Montana State University is accredited by the North West Commission on Colleges and Universities. The online Education major in Curriculum and Instruction that it offers provides the requisite professional development for teachers and educators from different professional backgrounds. It provides its students with the required academic preparation for educators who seek deeper knowledge in order to become master teachers, researchers, scholars, or curriculum coordinators in various educational agencies. The degree is designed to meet the needs of classroom teachers, educational scholars and researchers, subject matter specialists, curriculum coordinators and subject area supervisors. Tuition for undergraduates $6,850 and graduates $22,170 per year. Portland State University has been named one of America’s top ten up-and-coming universities, due to the strength and quality of its online degree programs, by the U.S. News & World Report. The Education programs available at the university align with the standards of, and receive accreditation from, the National Council for Accreditation of TeacherEducation (NCATE). They combine the convenience of an online education with the quality approach of the graduate school of Education at Portland State University. Students can choose between a wide range of programs all the way from early childhood, K-12, to adult education. This allows them to meet their specific career goals. Tuition costs $7,794 per year. Western Carolina University is accredited by the Commission on Colleges of the Southern Association of Colleges and Schools. At least, 120 semester hours are required for its online education program with a specialization in Early Childhood Education. This requirement is comprised of: Early Childhood Concentration, Birth-Kindergarten core courses, Liberal Studies,Early Childhood Concentration Courses and Guided Electives. The online-only education programs offer challenging and innovative curriculums that are designed to allow teachers to develop research skills, deepen content area knowledge, and improve the understanding of child psychology in order to explore current methodology and provide opportunities for curriculum development. Also, the coursework enables students to be leaders and decision makers who can implement and improve education programs. Tuition for resident undergraduates is $262.90 while for non-residents it is $417.90. For residents at the graduate level, tuition costs $309.30 and $509.30 for non-residents.